This mainly nocturnal cat is sandy brown or grey with distinctive orange ears and black strips on the tail. Felis silvestris lybica: subspecies of Felis silvestris (Wild Cat). 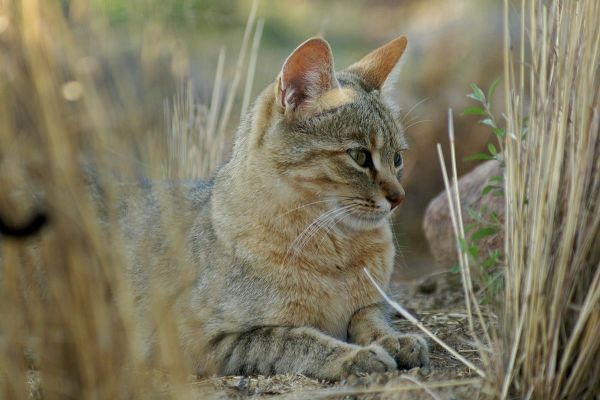 Subspecies origin: DNA studies suggest this subspecies split from the European wild cat 17, 3000 years ago and from the subspecies F. s. ornata and F. s. cafra about 131,000 years ago. Some Felis silvestris lybica individuals were domesticated in the Middle East 10,000 years ago. Conservation status: Cites Appendix II. Distribution: Africa and the Middle East. Pure genetic stock (if in existence), only in remote areas. Habitat: Steppes, savannah and bush land. Field characteristics: Head and body length 45-75cm. Tail length 20-38cm. Weight 3-6,5kg. Colour: Sandy brown, or grey, with distinctive orange ears. Black stripes on tail. Feeding: Primarily rodents and small mammals, also, birds, reptiles and insects. Mainly nocturnal. Breeding: Gestation 56-69 days. Two to six kittens are born, often in small dens in rock piles. Lifespan: 12 years in captivity. Social system: Solitary except when mating.